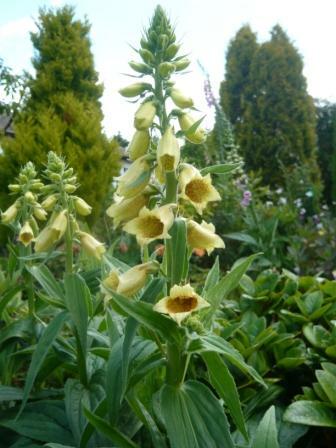 This year seems to be one of the best for growing good strong Foxgloves. This traditionally coloured Foxglove growing in good soil has reached 5 feet tall and now the flower stalk is putting on more height. This foxglove, unlike most of its cousins is flowering all around the flower stalk whilst other tend to have one bare side. I will collect seed from this large specimen and sow them in September for next year as they are biennials. Do not put up with poor seed or your plant stock will deteriorate. There is a good range of seed available. I have Apricot and white coloured varieties in flower at the moment but they are in poor soil and are not showing as well as the purple plant. 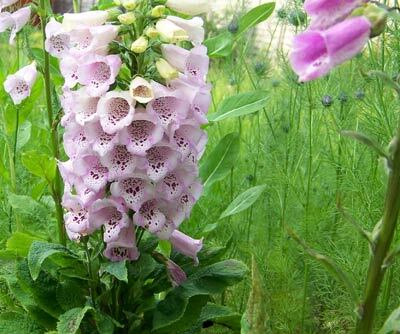 Foxglove flowers open from the bottom and finish well before the top ones are open. I nip out the top of the bloom spike as the first blossoms go over in the hope of getting more (albeit shorter) branches later in summer. Foxgloves are one of my favourite flowers, I’m not sure, why. They just are. Certainly their height is great in a mixed border. They can also have a long flowering season, especially if dead headed. 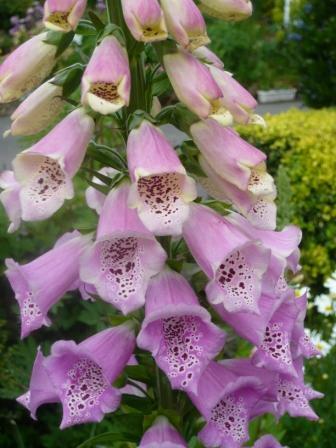 Always worth remembering – Foxgloves can be highly poisonous so be careful near children. Another great feature of foxgloves is that they do well, even in heavy shade. So well worth growing in shady spots. 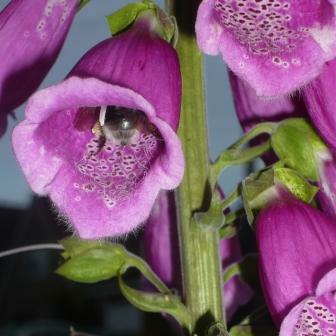 A close up of a Foxglove flower.